Exotic passion flowers look as though they are tropical plants, but they can actually be grown almost anywhere, including much milder areas. You may even find these delicate vines growing along the side of the road. Some passion flowers species are becoming invasive in warmer climates. The genus Passiflora contains over 400 species, so the common name passion flower can be a bit confusing. To muddle matters further, most are vines, but some are shrubs, annuals, perennials, and even trees and some also produce edible fruits. They all share exotic flowers that only remain open for about one day. The flower has a wide, flat petal base with five or 10 petals in a flat or reflex circle. The ovary and stamens are held atop a tall, distinctive stalk which is encircled by delicate filaments. The stigmas start out high above the anthers and slowly bend backward for easier pollination. Provide bright, indirect sunlight, but keep out of drafts. Minimum indoor temperature is about 50 degrees Fahrenheit. If you are bringing your passion flower indoors for the winter, it will probably go semi-dormant and look less than ideal, but it should perk up again in the spring. To keep your passion flower vines healthy and blooming, plant them in full sun to partial shade. In extremely hot climates, some afternoon shade is appreciated. Passion flowers need at least four full hours of sunlight a day; more in cooler climates and some partial shade in the hottest areas. The soil should be well-draining, but rich. Passion flowers grow and bloom best when the soil is kept moist. They do not handle drought well. Soil pH can be in the neutral range, anywhere from about 6.1 to 7.5. The addition of compost to the planting hole will help retain moisture. Some type of support is needed for the vines to grow on. It can be a trellis, a structure, or even another plant. Passion flowers should be given a deep watering immediately after planting. Passion flowers thrive with one or two deep waterings per week throughout the growing season, providing about 1 to 1 1/2 inch of water every week without rain. Passion flower benefits from an occasional light watering in dry climates. Plants may need winter protection in zone 6. In zones cooler than zone 6, they will die, unless you bring them indoors. Passion flower vines are heavy feeders. They benefit from a regular, light application of lower-strength, balanced, general-purpose fertilizer with similar proportions of nitrogen, phosphorus, and potassium. Fertilize the plant before new growth emerges in early spring, and then repeat every four to six weeks until early autumn. Passion flowers are low maintenance during the growing season and do not need to be deadheaded. Pruning is basically done to keep the size in check, to remove dead wood, and to make the plant fuller. Some vines will not need any pruning, but pruning will result in a fuller plant. Pruning can be done in late winter or early spring. In cooler climates, the vines may die back to the ground anyway. To protect borderline plants during winter, stop feeding in late summer. Mulch the area around the roots, once the soil temperature drops, to prevent freezing and thawing throughout winter. The more tropical the climate, the more pests there are to attack passion flower. Insects pests could include scale, spider mites, and whiteflies. Leaf spotting is generally caused by a fungal disease. Remove affected leaves to slow the spread and treat with a fungicide if necessary. Many gardeners prefer to grow their passion flowers in containers. Passion flowers grow quite happily in a pot and you have the convenience of being able to move them to a sunnier site or even bring them indoors for the winter. Plus, it limits the spreading by rhizomes. Most varieties of passion flower can be purchased as plants. They can also be propagated from either seed, softwood cuttings, layering, or rhizomes. To save seed, allow the fruits to ripen completely. Open the pods and remove, clean, and dry the seeds before storing. If you are saving seed from hybrid varieties, remember that they will not grow true from seed. Passion flowers seeds can be slow to germinate. Start seed by soaking for 1 to 2 days in warm water. Discard floating seeds. Place the well-soaked seed on the surface of damp potting mix, pat down, but do not cover since it needs light to germinate. Place the pot in a plastic bag and seal to retain moisture. If you can provide bottom heat (heating pad) to the pot, you will have a better chance of sprouting. It can take weeks or months for passion flower seeds to sprout. Keep the soil moist at all times. When sprouts do appear, keep them out of direct sunlight until there are true leaves. Transplant once it gets large enough with several sets of leaves. Although passion flowers are native in many regions of the Southern U.S., they can become a nuisance, to the point of being invasive. 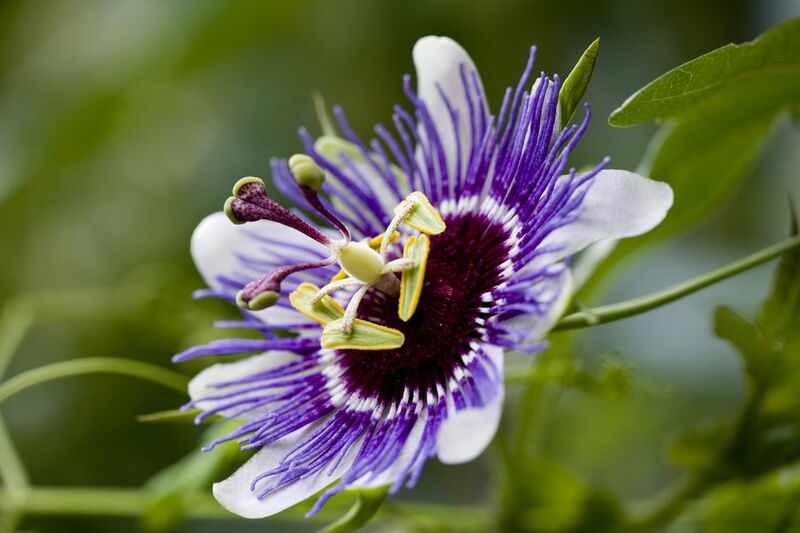 Check with your local Department of Environmental Conservation to see if you should avoid passion flowers altogether or if certain species are preferable. Popular varieties include. Passiflora alata "Ruby Glow" (fragrant granadilla): This very fragrant variety has 4-inch flowers with cranberry petals and rich purple filaments. Passiflora edulis: This is the species usually grown for the edible passion fruit. There are two types of passion fruit: a small, purple fruit and a larger shiny yellow-orange fruit. Passiflora incarnata (maypop): This a subtropical passion flower native to the southeastern U.S. Passiflora incarnata is also used medicinally. What's Your Birth Month Flower?